View all the Straight Talk plans that work with the ZTE ZFive 2. Compare Straight Talk plans that are compatible with the ZTE ZFive 2 using our tool below. 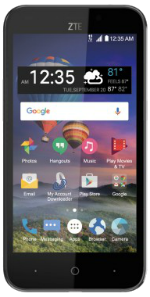 The ZTE ZFive 2 is a 4G LTE smartphone that runs on Android 6.0.1 Marshmallow out of its box. It comes with a 5-inch display. It is equipped with a 1.4GHz Quad-Core Qualcomm Snapdragon MSM8917 processor with 1GB of RAM. There is an onboard storage of 8GB with a microSD card slot for up to 32GB memory expansion. For photos, the device has a 5-megapixel main camera and a secondary 2-megapixel camera in front. The ZTE ZFive 2 comes with a 2,800mAh non-removable battery.